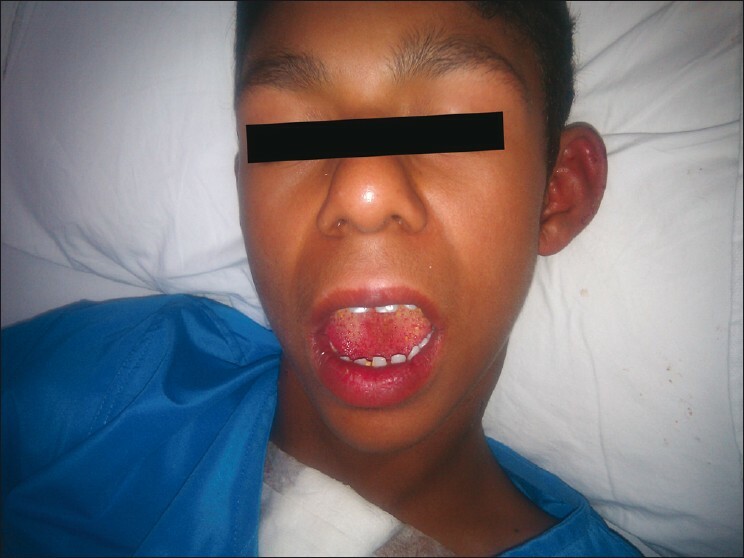 A 12 year old boy presented with exertional dyspnoea since early childhood. On examination he had mental retardation, malformed teeth, broad lower lips, pectus carinatum, clinodactyly and kyphoscoliosis. The right radial pulse was better felt than the left. An ejection systolic murmur was best heard in the right 2 nd intercostal space. The patient was diagnosed as having William's syndrome. Investigations showed supravalvular aortic stenosis with a gradient of 170 mmHg. [Figure 1] shows pigtail catheter in the left ventricle with opacification of aortic sinuses, coronary vessels, ascending aorta with arch, arch vessels and descending aorta. 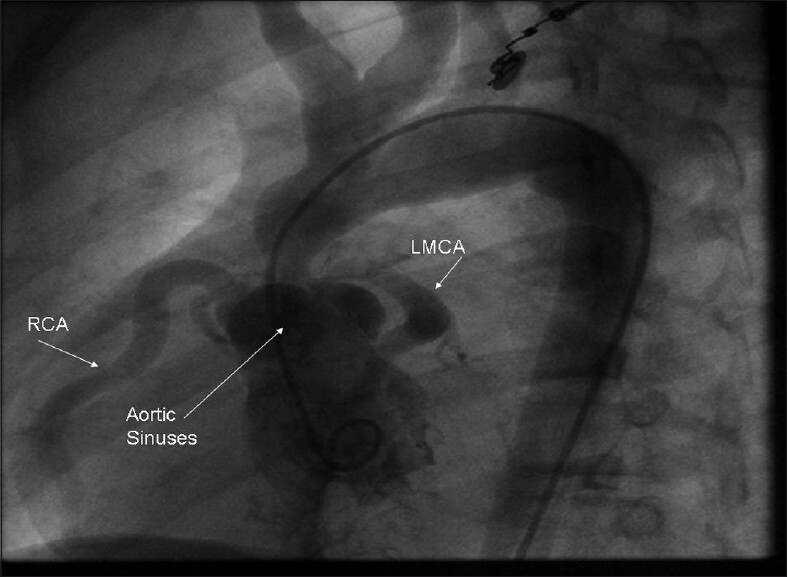 Labelled structures are right coronary artery (RCA) and left main coronary artery (LMCA). The patient was operated by double-pericardial patch repair of the supra-valvular portion of the aorta with no residual gradient. Photograph of William's syndrome [Figure 2]. Williams-Beuren syndrome is a multisystem disorder caused by deletion of the Williams-Beuren syndrome chromosome region, spanning 1.5 million to 1.8 million base pairs containing 26-28 genes. This syndrome was named after J.C.P. Williams in 1961. In 1962, Alois J. Beuren and associates  pointed to the characteristic "elfin facies" and, later, to the possibility of an association with pulmonary artery (PA) branch stenosis. The real frequency of the syndrome is unknown, although it is estimated to be 1 in 10,000-50,000 live births. The involved include cardiovascular system dental, endocrine, gastrointestinal, genitourinary, musculoskeletal and ophthalmic systems. There can be developmental delays with a low intelligence quotient (I.Q. ), and characteristic facies are associated with descriptions as cute or pixielike, with a flat nasal bridge, short upturned nose, periorbital puffiness, long philtrum and delicate chin; whereas older patients have slightly coarse features, with full lips, a wide smile and a full nasal tip. The cardiovascular system is frequently involved. The findings include supravalvular aortic stenosis, peripheral pulmonary artery stenosis, hypertension (renovascular cause is occasionally seen), mitral valve prolapse and ventricular septal defect. Very rarely, it is associated with strokes and sudden death. Supravalvular aortic stenosis and sinotubular junction stenosis are rare outside the setting of Williams-Beuren syndrome, except in familial supravalvular aortic stenosis syndrome. It occurs in approximately 70% of the patients affected with this syndrome. The arterial narrowing is due to thickening of the vascular media from smooth muscle overgrowth and can lead to stenosis of medium and large arteries. The arterial narrowing is also known to occur in numerous locations, including aortic arch, the descending aorta and the pulmonary, coronary, renal, mesenteric and intracranial arteries. An increased carotid artery intima-media thickness consistent with generalized elastin arteriopathy is present in all cases. The myxomatous degeneration of the aortic or mitral valve leaflets, or both, occur in up to 20% of the patients. Stenosis or occlusion of the coronary ostia can occur in the absence of supravalvular aortic stenosis. Cardiovascular complications are the major cause of death in patients with Williams-Beuren syndrome. One study showed a cardiovascular-associated mortality of 25-100-times than among the controls. The risk factors of sudden death include administration of general anesthesia in cases of biventricular outflow obstruction, biventricular hypertrophy or stenosis or occlusion of coronary ostia. 1. Pober BR. Wiiliams-Beuren Syndrome. N Engl J Med 2010;362:239-52. 2. Beuren AJ, Alpitz J, Harmjanz D. Supravalvular aortic stenosis in association with mental retardation and a certain facial appearance. Circulation 1962;26:1235-40. 3. Greenberg F. Williams Syndrome. Pediatrics 1989;84:922-3. 4. Pober ER, Johnson M, Urban Z. Mechanism and treatment of cardiovascular disease m Williams-Beuren syndrome. J Clin Invest 2008;118:1606-15. 5. Eronen M, Peippo M, Hiippala A, Raatikka M, Arvio M, Johansson R, et al. Cardiovascular manifestations in 75 patients with Wiliams syndrome. J Med Genet 2002;39:554-8. 6. Wesel A, Gravehorst V, Buchhorn R, Aosch A, Partsch CJ, Pankau R. Risk of sudden death in the Williams- Beuren syndrome. Am J Med Genet A 2004;127A:234-7. Herriges, J.C. and Yi, L. and Hines, E.A. and Harvey, J.F. and Xu, G. and Gray, P.A. and Ma, Q. and Sun, X.